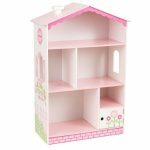 If your child loves dollhouses, then a dollhouse bookcase is a perfect item for their bedroom. Not only are they a fun and attractive piece of furniture, they also serve multiple practical purposes. 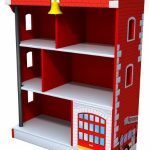 There are many different styles and types of doll house bookcases available, so you can find one that matches the décor of your child’s bedroom and is fit for the purpose for which it is required. They can be purchased ready-made or built and customized to fit your child’s tastes and room size. What is a Dollhouse Bookshelf? A dollhouse bookcase is a bookcase in the style of a dollhouse. Most dollhouse bookshelves are similar in shape to a regular bookcase with the exception of the pointed roof at the top. Many of these are also decorated with a design that depicts the doll house style. You may also come across another type of miniature dollhouse bookshelf. These are the pieces of furniture for inside a dollhouse and are an item that you can buy separately as an accessory to your child’s dollhouse. Dollhouse Bookshelf DIY or Buy? You can either buy a dollhouse style bookshelf or make one yourself. There are three things to think about when deciding whether to buy or DIY. First, you need to think about your budget. If you have limited funds, then making the bookshelf yourself may save you money. However, this will depend on the materials you use. There is a vast difference in the prices of different woods you may use to build a wooden bookcase. Second, do you have the skills to make the bookcase? You should only attempt to build a large piece of furniture such as this if you have experience of working with the materials and tools. A final consideration is the quality of finish. Manufactured bookshelves are produced to a high standard to meet the needs of customers. Ask yourself whether you are capable of producing an item that is of equal or better quality. If you opt to build a bookcase, then there are three ways in which you can go about doing this. Which option you choose will depend on the design you want, your budget and the level of your DIY capabilities. The first option is to buy a DIY dollhouse bookshelf kit. If your DIY skills are limited, then this is probably the best option as the kit will supply you with everything you need to complete the project, including pieces that are already cut to size. Also, the assembly instructions are included to guide you through every step of the assembly process. The second choice is to make your bookshelf from scratch using your own design ideas. You should only attempt this if you have a reasonable DIY skill set and know how to use tools safely. To make a wooden bookcase, it’s helpful if you know about creating joins, making the pieces safe (i.e. soft edges), and the best methods to use. Finally, you can adapt a regular bookcase to make it look like a dollhouse one. Adding a triangular roof by adding two pieces of wood at an angle to the top of the bookcase will transform the shape. You can then paint the bookcase and add further details to make the design look more like a dollhouse. For example, you can paint tiles on the roof, add windows to the sides and even paint a climbing plant up the walls. What Are the Different Ways It Can be Used? A dollhouse bookcase is a multifunctional piece of furniture. The most obvious use of a bookcase in this style is to store books. However, you can also use it to store any other toys, stationery items or personal possessions. A bookcase is also a fantastic way to display attractive items or things that mean a lot to your child. For example, you can display any trophies they have won for any sports or hobbies in which they participate. Similarly, you can display ornaments, collectibles, and even smaller dollhouses. Finally, this style of a bookcase is an interesting and attractive feature in a child’s bedroom. They are an aesthetically pleasing focal point that contributes to the overall décor of the room rather than simply acting as a practical item. One concern that many parents have about large pieces of freestanding furniture is that they are a safety risk. They worry that the bookshelf will fall over and injure their child. However, there are steps that a parent can take to reduce the risk of this happening. By placing the heaviest items on the bottom shelves and not overloading the bookcase, you are limiting potential risks in two ways. First, if the weight is predominantly at the bottom, the piece of furniture is less likely to tip. Second, if the shelf did tip, there are fewer items to cause harm. However, the safest precaution you can take is to secure the bookcase to the wall. This is simple to do, even for a DIY novice. It is possible to buy small brackets to attach the furniture to the wall by positioning them on each side at the top, bottom, and mid-point of the piece and screwing to the wall. Is a Dollhouse Bookcase Gender Friendly? While some dollhouse bookcases will suit boys better and others are designed with girls in mind, it is perfectly possible to find a bookcase of this type that is gender-neutral. If you decide that buying a bookshelf is the best option for you, then you will find a wide range of options on t market. Different styles and sizes are available with pieces available to suit all budgets. 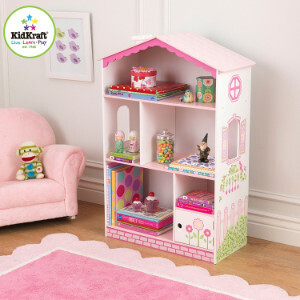 The KidKraft Dollhouse Cottage Bookcase is a beautiful piece in pinks and pretty pastels. It has shelves for storage of items of different sizes. This is ideally suited to little girls and is one of the more expensive options. 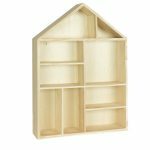 There are many cheap dollhouse bookshelves that are gender-neutral and some of these are described as playhouse bookcases or bookshelves. These are more basic in design, such as plain wood. However, you have the option of either leaving these plain or customizing the bookcase yourself to match the décor in your child’s room. Some of the bookcases available also incorporate a cupboard or a drawer in addition to the shelving. This is perfect if you have some items that you want to display and others that you wish to store out of sight. No matter what your budget is and which style of bookcases you prefer, you will find the perfect piece of furniture for you. It is possible to use these in a variety of ways, including as storage and as a stunning element of the interior design in your child’s bedroom. If you cannot find an item that perfectly matches your décor or you have a limited budget, it is even possible to create this piece of furniture yourself and there are several ways to do this. To view some awesome DOLL HOUSES for kids click here!